While the term ‘customer onboarding’ sounds like a separate part of business, it is actually fundamental to excellent customer service and the retention it can breed. In a competitive, customer-centric culture, onboarding can give your business the edge it needs to reduce customer churn for maximum profitability. In this article, we’ll cover the essentials you should know when you’re developing your customer onboarding process, and also what to avoid. 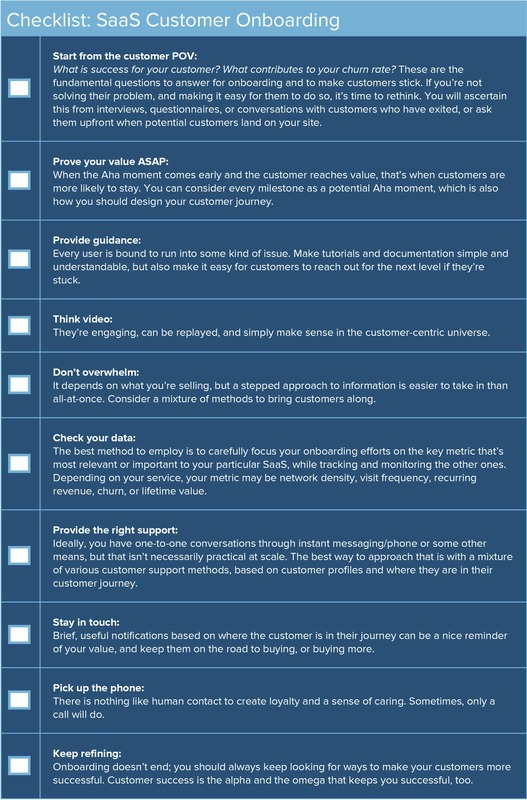 You’ll find pointers from experts that includes advanced checklists and best practices to keep your customer relationships stronger, longer. Discover the top four hidden costs of client onboarding and how to overcome them. 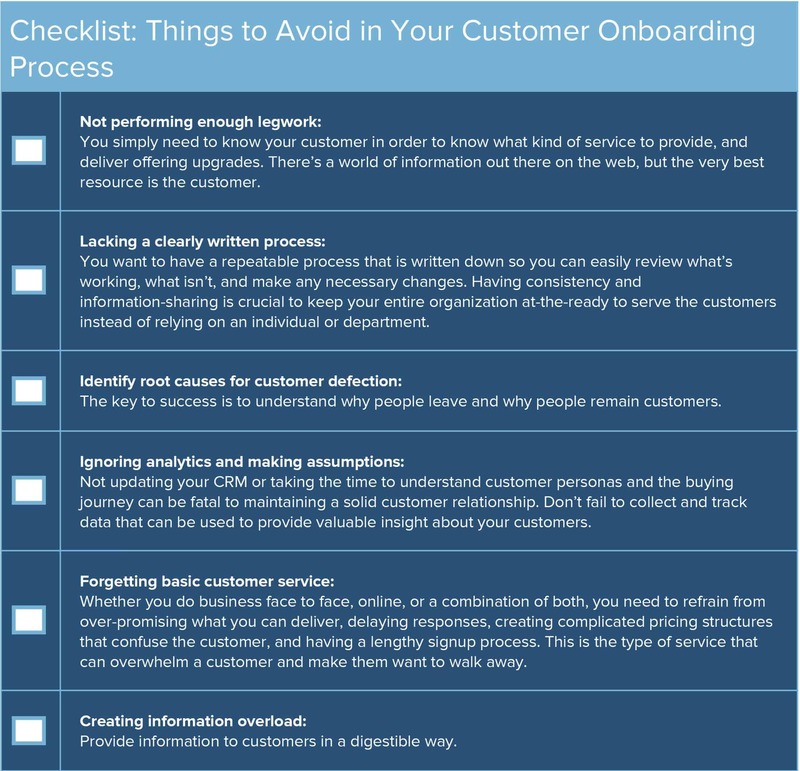 Simply stated, customer onboarding is the process organizations use to take on new clients. It’s the way a company explains how their product or service works, the value of their solution, and ways you work with customers. An intrinsic component of excellent customer service, onboarding is the first step in the customer journey. If well-executed at every touchpoint from first contact to purchase and thereafter, it can be the beginning of a long and fruitful relationship. You can find great tips, checklists, and details about a client’s journey at The Definitive Guide to Client Onboarding. The length of time it takes to completely onboard a client varies depending on your organization. If you’re a professional service that sells directly to a client through face-to-face interaction, the rule-of-thumb is that the process should last about 90 days. For Software-as-a-Service (Saas) companies, the process from first contact may take longer, particularly for businesses that offer 30 day free trials. Skillfully managing onboarding is good for your team and your customer. First and foremost it reduces churn by enhancing customer satisfaction as it increases revenue. Well-organized and documented customer onboarding also generates greater employee satisfaction because it makes interactions less stressful and more productive with more-effective ways to collaborate across functions and levels for practical gains throughout the organization. 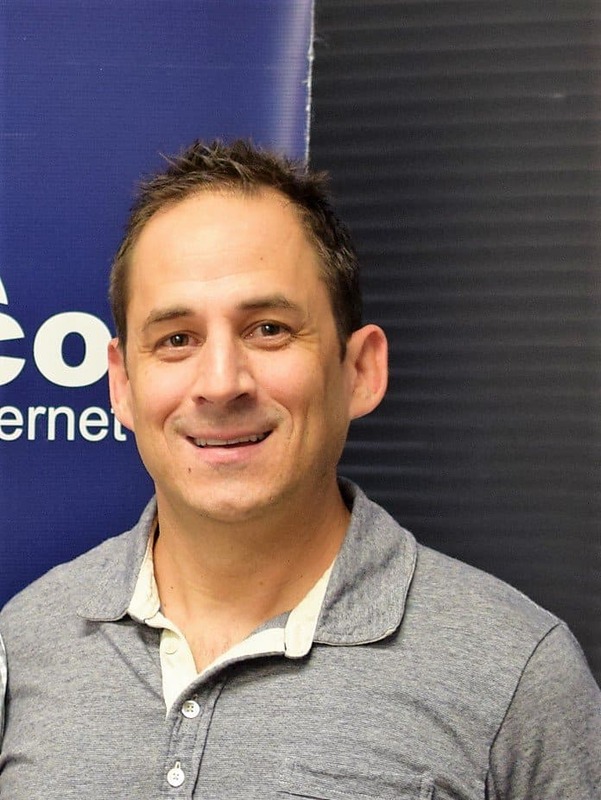 Sacha Ferrandi is the Founder of Source Capital Funding, Inc. and Texas Hard Money. In their twelfth year of service, the San Diego-based companies have a team of experts in real estate finance operating in Texas, Minnesota, California, and Arizona. 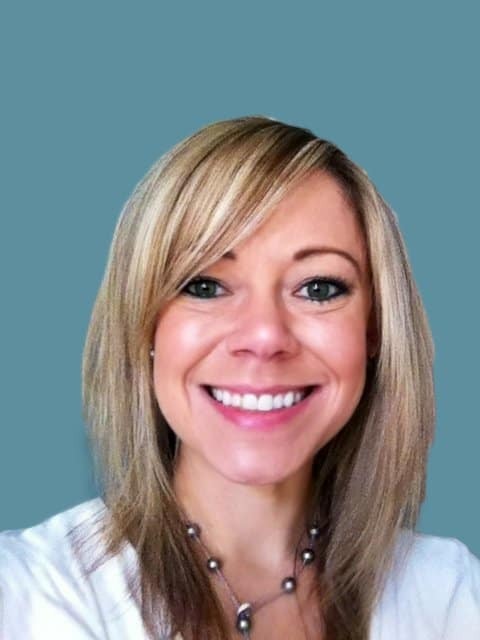 Tabitha Jean Naylor is the Founder of Successful Startup 101, a digital magazine that provides answers to today's most pertinent questions facing startup founders, and the Owner of TabithaNaylor.com, a marketing firm for startups and small businesses. 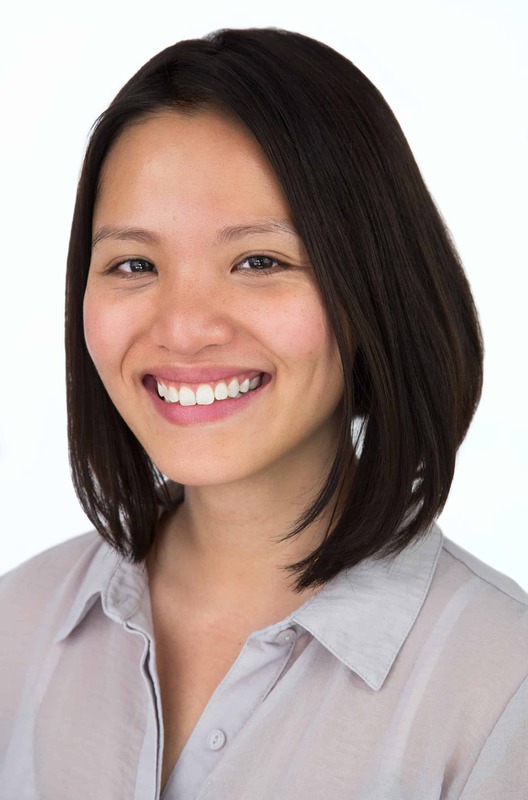 Angelique Pivoine is the Owner of Good Thinking Agency, a full-service marketing/PR agency offering a range of services from branding strategy to media outreach to inbound marketing services. Pivoine is a quoted expert on MSN, HuffingtonPost, NFIB, and numerous other media outlets. One of the interesting things that came up in our conversations with the experts was that while there are many do’s to make new customers feel welcomed and supported, knowing about and avoiding the don’ts can be equally as important. All three of our experts agreed that one of the most difficult and most necessary aspects of onboarding is simply knowing when it’s time to let go of a customer. It’s better to take the understanding you’ve gained and focus on retaining customers who value your product and service, and not create ill-will by holding on to dissatisfied customers who tend to air their grievances in online forums. Take the time to thank them for their business, and be sure to conduct an exit survey. In an ever-more competitive marketplace for just about any product or service, it takes a lot of time, effort, and money to bring in new customers, so the last thing you want to do is turn off hard-won relationships. A study by PowerswaterhouseCooper LLP found that most efforts to prevent customer churn fall short because they come too late in the buyer journey, and that it’s more profitable to understand why customers leave and then shift your model based on real data as fast as you can. Keep churn at bay by starting early and being armed with the information and willingness to be flexible in the way you work with customers. Now that we’ve looked at how less-than-optimal onboarding can result in failure to retain clients with, let’s move on to the positive actions you can take. The customer/user experience is essential a to a successful business, so it’s imperative that you use everything in your arsenal to understand what your customer needs, wants, and how to simplify their journey to buying (and more buying). According to the Harvard Business Review, the average American business loses 50 percent of its customers every five years. The reason: Two-thirds of respondents said they received inadequate customer care. In the same study, 91 percent of small businesses said that they do nothing to retain their existing clients. That’s not the way to win in competitive times. 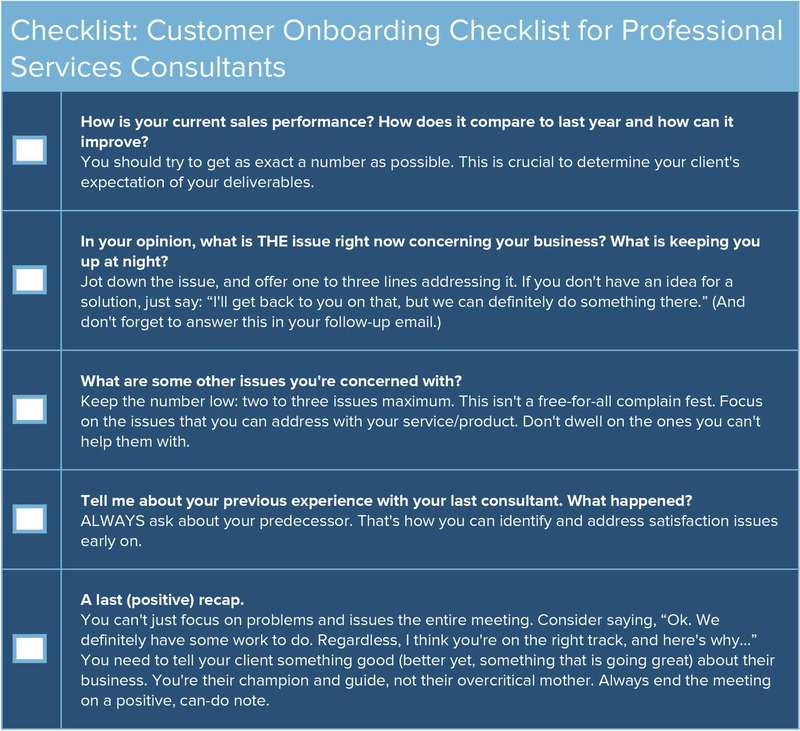 Our experts gave us their tried and true best practices tips to help you start or refine your own customer onboarding process. Make it casual and personalize with the first name. Welcome and thank the customer for joining you. Describe your company, your mission, and how you help the customer succeed. Describe what the customer should do next to set them up for success. Link them to a landing/getting started page with a CTA/download. Offer to answer questions or provide help. Provide a link or explain the best method to do so. Make it friendly, brief, and personal. Once you’ve gotten off to a good start, keep the communication going by getting feedback to help you improve your relationships and onboarding process. How do you collect and prioritize customer data during the onboarding process so that it’s useful? Cloud-based tools and software are low-cost, flexible, and provide a way to manage and automate collaborative customer onboarding work. Our experts noted that the use of key performance indicators (KPIs) are useful to measure your success and that of your customer. With the right tools you can use them to identify friction points and make repairs quickly, and most importantly share them with your team. KPIs for customer onboarding researched by Service Source include customer time to value, activation rate, adoption rate, product/feature utilization score, expansion bookings, net new bookings, and retention rate. Effectively onboarding your customers is essential to whether they engage with and actually use your product. If not done right, poorly onboarded users may leave in search of a different solution, which lowers retention and expansion rates and ultimately impacts your bottom line. That’s why you need a solution that will help you manage customer onboarding efforts. One such solution is Smartsheet, a work management and automation platform that enables enterprises and teams to work better. 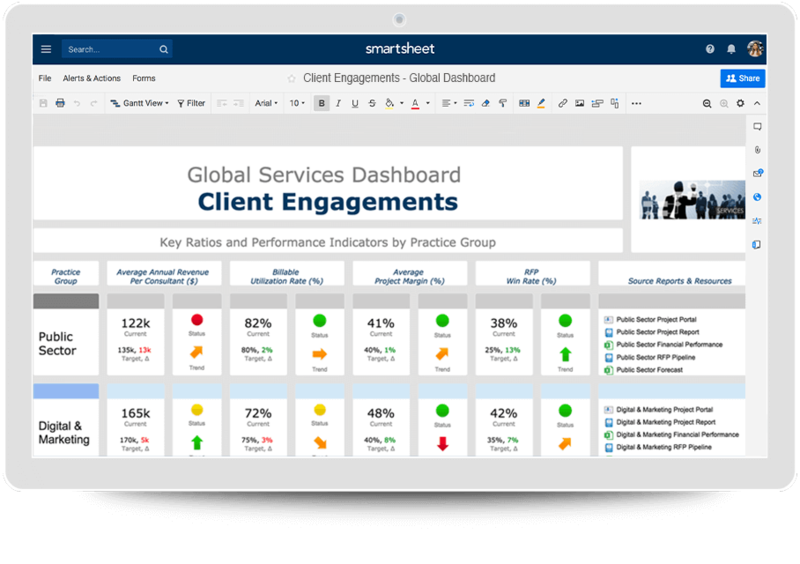 Leading services professionals rely on Smartsheet for client onboarding project prioritization, scheduling, initiation, and delivery. 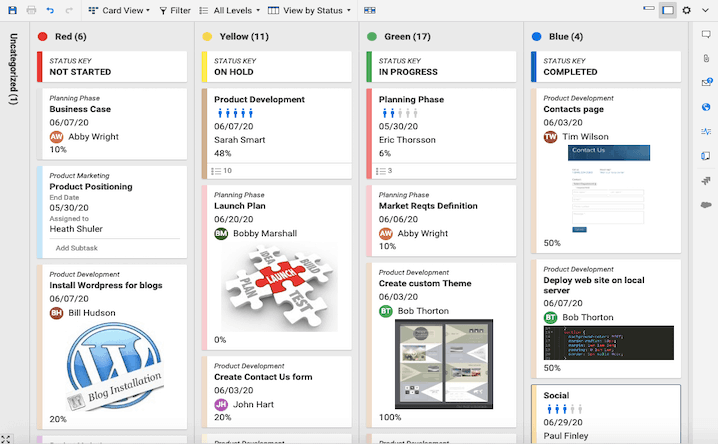 Use Smartsheet to improve visibility, increase accuracy, and accelerate delivery. Automate project initiation, improve relationships between service and sales teams, and keep customers up to date. With a standard process for intake, production, and delivery, you can communicate clearly with clients and establish a foundation of transparency and trust. Discover how Smartsheet can help maximize your client onboarding efforts, today.